Tennis players travel the world, and when they’re not on court, they explore the incredible places their career takes them. One player is taking fans along for the ride! 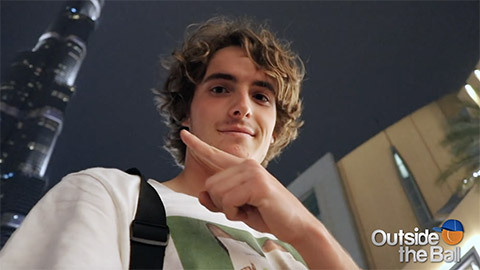 OTB correspondent Murphy Jensen talked to Stefanos Tsitsipas about his travel Vlog on Youtube. Tsitsipas went on to describe the Youtube channels that inspire him and the content creators that are his idols away from the tennis court. Stefanos also revealed which fellow tennis pro he’d want as a guest on his vlog and it was none other than Roger Federer!” Technology allows you to share things, share ideas and stories with people. Technology is a great way for communication if you use it in the right way!”, the tennis star concluded. We love to see a player thinking outside the ball! You can follow Stefanos on his epic travels each week on his Youtube Channel where fans truly get a behind the scenes look at what it’s like to live and travel as a professional tennis player.